Outfit for LFW: Hello Spring! It’s been a while since I last wrote an outfit post! Although I’ve been keeping up with fashion posts, I believe that the last outfit post I wrote was around 2 and half months ago featuring a party outfit! There are basically two reasons for not posting an outfit post earlier: 1. lack of time and 2. it’s FREEZING outside! Anyways, as the temperature is getting slightly better (how is it Spring already? ), I braved the cold and actually took photos outside for once. I wore this outfit to a London Fashion Event with River Island last month – well, I was planning to at least! But I ended up wearing a pair of trousers instead of the skirt. 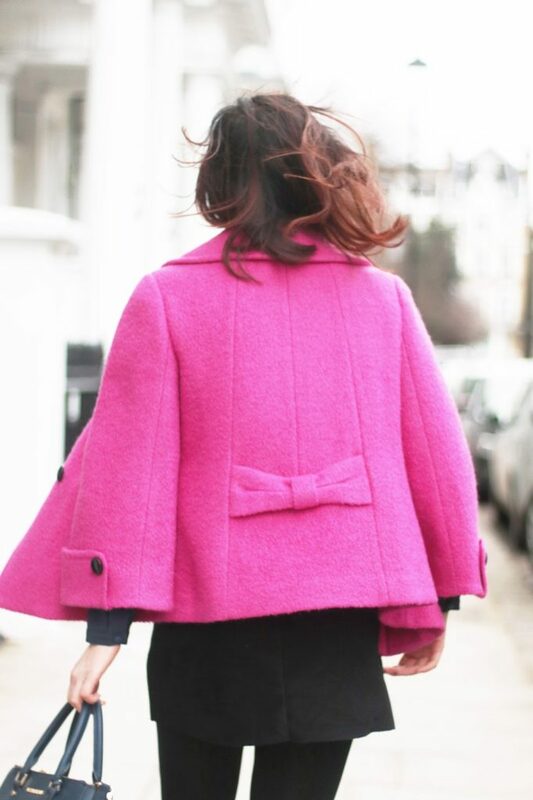 The pink or fuchsia coat is definitely my favourite part of the outfit! I got it for Christmas and I been looking forward to wearing it since then and as it’s the first day of Spring, I thought it would be the perfect day to introduce this to you guys! Other than looking super bright, the material is also fab. It’s made of cotton and is a lot warmer than it looks! The skirt is also something I LOVE and have been looking forward to wearing for a while now. You can’t really see this in the photos, but the blue and silver patterns are embroidered onto the suede! I got this at AliExpress, which is basically like eBay, but with even more products at a cheaper price! Unfortunately, this coat is not available in the UK, but I will let you guys know if I spot something similar! I also have a new Instagram where I will be posting more fashion and beauty photos. I will still use the other Instagram (@FjordBeauty) for events, but will slowly transition to @Liviatiana.